Tavis Weaver, 49, a veteran mail carrier with the U.S. Postal Service, delivers mail along Ohio Street on Friday morning. 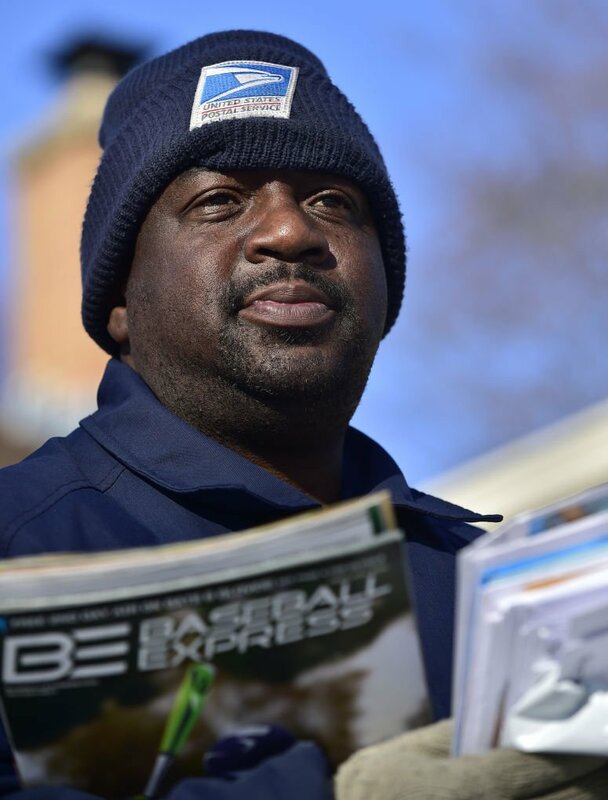 Tavis Weaver, 49, a veteran mail carrier with the U.S. Postal Service, delivers mail along Ohio Street on Friday morning, January 30, 2015. RACINE COUNTY — If you’ve recently suspected that letters and bills have been a bit slower in arriving in your mailbox, you’re not imagining it. Last month, the United States Postal Service implemented changes to the way it processes all First-Class Mail that isn’t big enough to be considered a parcel. Facing a dramatic decline in the mail volume, the agency announced in 2011 that it would be consolidating the processing and distribution facilities and making revisions to its First-Class Mail service standards. Those standard changes, which took place nationwide on Jan. 5, resulted in the average processing and delivery time for a piece of First-Class Mail, such as a birthday card or magazine, to increase from an average of 1-2 days to an average of 1-3 days, explained Sean Hargadon, spokesman for United States Postal Service. Despite efforts by the U.S. Postal Service to educate the public about the adjustments, Hargadon said it’s likely that those who noticed the delays weren’t aware the changes were coming. While there is a chance the changes could be leading to delays longer than a day or two, Hargadon said U.S. Postal Service customers should contact their local post office or postmaster if there is a longer delay. There could be something else going in their region or at their post office that could be causing the problem, he said. That’s likely the situation in the Village of Rochester, Hargadon said, where a village employee and a village trustee said they have noticed delays in First-Class Mail of more than a week. Village of Rochester Deputy Clerk Treasurer Sandi Swan said Thursday that she had just received a “big batch of mail” and found a piece that had a postmark date of Jan. 6, as well as other pieces of mail postmarked Jan. 20. Village Trustee Chris Bennett, a candidate for village president, said he had been expecting an agenda for a village meeting that took place on Jan. 20, only to receive it in the mail on Wednesday, more than a week after the meeting actually took place. At first Bennett had heard the delay might be due to staff reduction at an area sorting facility, but Hargadon said that wasn’t the case. The USPS did recently dismiss some seasonal employees that had been working during December, but that likely would not lead to the kind of delay Bennett and Swan experienced, he said. The postmaster for the Village of Rochester, Jeanette Kennedy, can be reached at 262-534-6100. The United States Postal Service has increased the average delivery time for First-Class Mail from an average of 1-2 days to 1-3 days. The changes — officially implemented on Jan. 5 — were made to help the agency adjust to a dramatic decline in mail volumes. Delivery standards have not changed for packages, medicine sent through the mail in any type of package form or Standard Mail, the primary source of advertising mail. They step up to break bulk shipping method which is more effective. Must we Always copy the lower levels of overseas countries ? Because this is what's going on - we are revising our ways to reflect the UK and others, mail systems -- Probably part of the one-world government tyranny system. Our local post office is absolutely horrible. They've lost a handful of packages this year. The article says to contact them, which we have numerous times and they just don't care. And their attitude proves that point even more. Someone needs to kick the manager/supervisor out of their and get someone who has amazing customer service skills to show them how to act when important documents or packages worth 100's of dollars are not being delivered to my home, even though their website tracker says they've been delivered. Hate. It. I redeliver for next door neighbors, but it gets more difficult when it's a few miles away. hey here's an idea, u get a piece of your neighbors mail, walk next door and give it to them. u might actually get to know your neighbor. u might actually start to talk to one another. u might make your street a neighborhood! Lower the price of stamps then as well right? You would think being better, faster and more accurate would be the aim when implementing a change. Stop Saturday delivery. Its been on the drawing board before but they've never done it. Why? With the mail service being slowed down more and more people with use the internet now so what good is this? My problem is receiving other people's mail, I'm quite frequently redelivering and often wonder who's receiving mine. My mail gets delivered to other people also. I'm on a rural route and when there is a sub delivering I can almost be certain...that others get my mail and vice versa. No reason for it! !